Take one CVS "disposable" camcorder, an old Palm Pilot hot-sync cable, a USB cable, and some software from the Internet, and voilà! A re-usable digital camcorder for only $30! I know this is probably old news for a lot of people, but CVS recently came out with a "disposable" digital camcorder. It costs $29, and lets you record 20 minutes of 320x240 resolution digital video. When you are finished recording your 20 minutes of video, you are supposed to take the camcorder back to CVS where they will put the video on a DVD for another $12 or so. But, they keep the camcorder. So, you pay about $2 per minute for some poor resolution video. 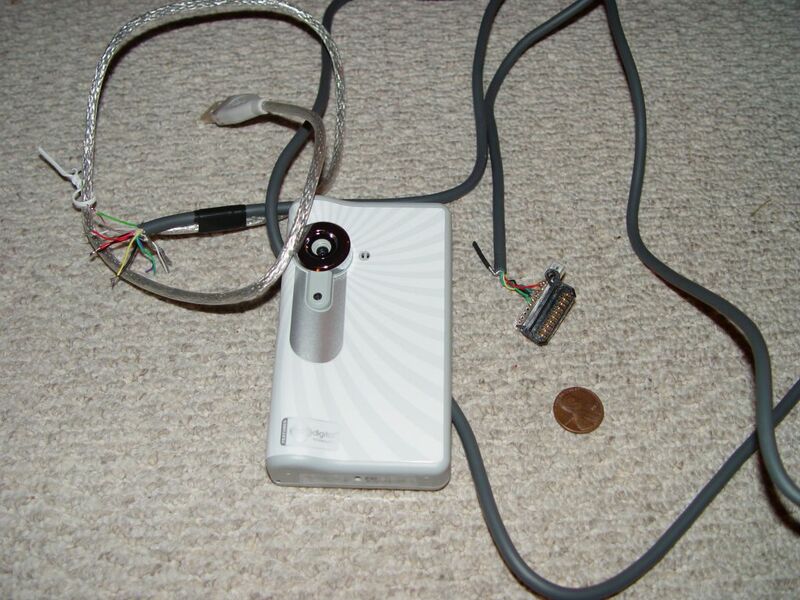 Well, the good news is, a few people on the Internet took to tinkering with the camera and figured out how it works and how to download the video to a PC without having to take it to CVS. A fairly detailed description can be found here. So, I finally got a chance to follow the instructions and after about a half hour's worth of effort of cutting cables, soldering wires, and installing software, I was able to download video off the camera. Now I have a very inexpensive and compact digital camcorder to play with. For now, I'll probably use it to record videos of karate practice so I can get a better idea of what I might be doing wrong or need to improve. Plus use it as a historical record to see if I'm actually improving or not. A friend suggested attaching the camcorder to a kite to take arial videos. Maybe I'll try that, too. The camera is cheap enough that I won't worry too much about damaging it. I should probably buy another one as a backup.